Now that I'm using Ubuntu, I'm also using OpenOffice. However, I like Google Docs quite a bit so I've used OpenOffice sparingly. I've had trouble with Google Docs though; the Download as Word bastardizes the document. Looks great as a pdf, not so much as a Word document. The reason for creating a Word document is for recruiters, they all seem to have some sort of application that parses the Word document and fills in your employment history and such. This would be a great place for XML and some sort of standard wouldn't it? and disabling everything I can find...try again. Same result. Reading this thread, I begin to wonder if it's like Excel...you know, you enter a date and it automatically puts it into the default date format. 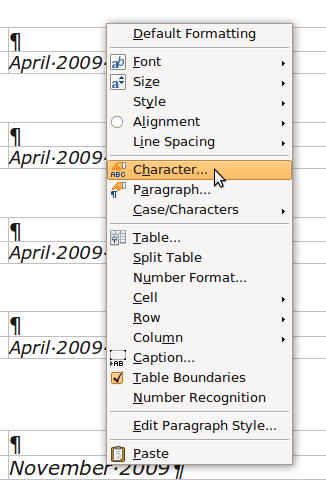 Sure enough, right click on the column, select "Character" and voila! No more transformation. I love Latex for generating docs. Of course, it doesn't do Word, but the PDF and programmability are hard to beat. I think I remember you talking about that some time ago...Specially I believe it was in regards to some math. Of course I have the memory of a...well, I don't have a good memory.